YOU'RE READING Offset’s on-stage apology to Cardi B - romantic gesture or ambush? Cardi B (L) is presented a 'Take Me Back' card onstage by her husband Offset (R) at Rolling Loud Festival in Los Angeles. Screenshot - Twitter. 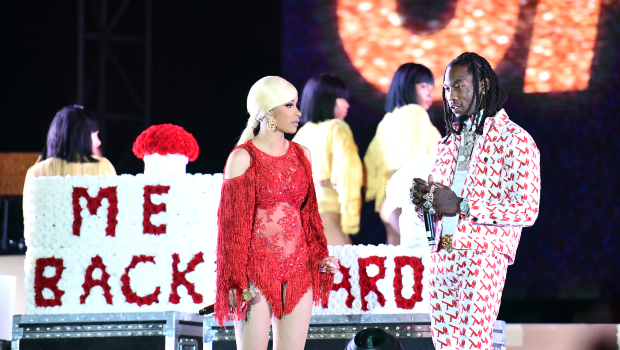 After sharing a rather emotional apology clip onto his Instagram account dedicated to his wife following cheating allegations, Offset decided to take it up a notch and surprise Cardi mid performance on stage in Los Angeles with a lavish floral arrangement. Romantic right? Well no, especially based on Cardi B’s reaction in which she seemed rather unimpressed with his impromptu onstage ambush during her performance at the Rolling Loud Festival. Time & place - and this wasn’t it! Following the onstage interruption the first time mom remained quite steadfast in her decision to not take her husband back even when the crowd overwhelmed her with ‘take him back’ cheers. Many of Cardi’s fans, however, pointed out how it was quite convenient for Offset to cheat and because he was ‘caught’ he was now using the “public forum to bully Cardi B into taking him back… is so wrong and so manipulative”, tweeted one user. I understand his desire to work it out. He proposed to her this way. Why not go back to where it all “started”? He meant well. But, given this moment in @iamcardib’s career and her ascension in the music industry, it was an #epicfail. Give @OffsetYRN a break. Prior to the on-stage ambush Cardi B came to her husband’s defense and pleaded with fans to stop bashing him. “I just don’t like that bashing online thing,” said Cardi in a video posted onto IG. While the duo who welcomed their first child together earlier this year remain public figures that have without a doubted gained much of their fame from their incredible music careers amongst other things, it is important to also note that cheating should never be condoned. Whether Cardi decides to reconcile with her husband or not it remains her choice to make – not just for herself but for her daughter’s sake. "I made friends with the woman who was dating the guy I was seeing"